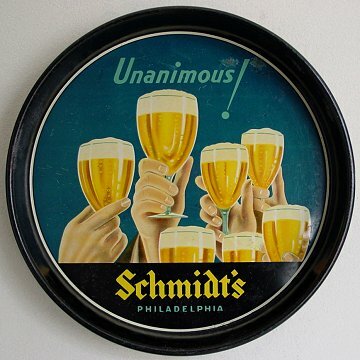 C. Schmidt and Sons, Inc.
Philadelphia, Pennsylvania Comments: I have been told by a few PA collectors that this tray is tough to find in very good shape. Most have significant humidity marks. This one has some, but is not too bad. I bet if you found a near mint one it would go higher than my estimate above. I think this is a sharp tray. I picked this one up from Lou before he went into the Auction business. Trivia Answer - Question #28: This tray is know as "Unanimous! ".